Hmm. This one sounds like something from a college entrance questionnaire. I’m old enough to remember the Cold War and the fall of the Berlin Wall. I remember the 1990s fondly and love grunge although my favorite band is U2. I grew up reading J.R.R. Tolkien, Arthur C. Clarke, Terry Brooks, David Eddings, Stephen R. Donaldson, Isaac Asimoc, Anne McCaffery, Andre Norton, and many others. And now, I practice medicine but when time allows, I write epic fantasy novels. If I had even more time, I’d build furniture. I love the smell of cut wood. 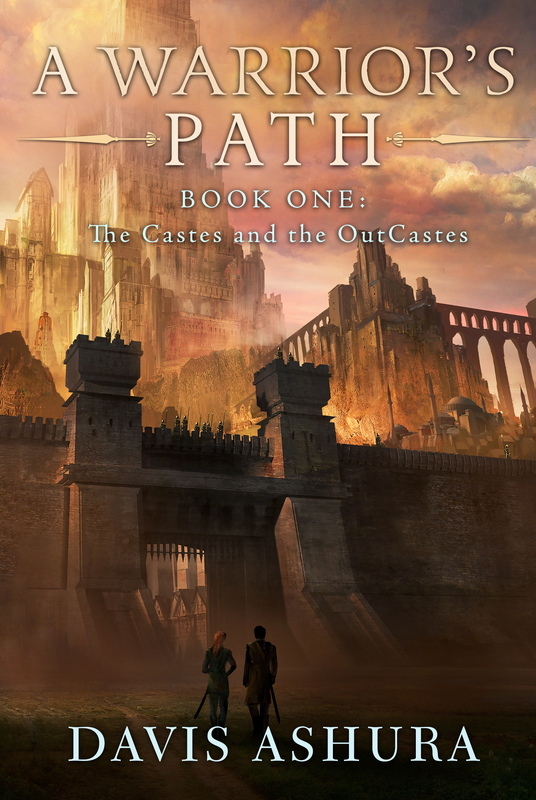 2) Tell us about The Castes and the OutCastes series. The Castes and the OutCastes is a classic trilogy comprised of A Warrior’s Path, A Warrior’s Knowledge, and A Warrior’s Penance. The story sweeps from the majestic city of Ashoka to the perilous Wildness beyond her borders. It is a world where the demon Suwraith rules and where Caste determines mystical Talents, the purity of Jivatma expresses worth, and dharma may be based on a lie. It is a world very much based on attributes of Indian culture, and into this world is born Rukh Shektan, a peerless young warrior who has always understood duty. He is expected to take part in the deadly Trials–to journey the Wildness where Suwraith rules and protect the caravans linking Humanity’s far-flung cities. Karma, however, is a fickle fiend. His caravan is destroyed by the monstrous Chimeras; twisted servants of their fearful goddess, Suwraith. While Rukh survives the attack, events force him along an uncertain path. Morality becomes a morass – especially when he encounters a mysterious warrior, Jessira Grey, a woman whose existence ought to be impossible. The holy texts warn against her kind: ghrinas, children of two Castes, abominations. They are to be executed whenever discovered, but for the first time in his life, Rukh defies duty. Jessira may be the key to his city’s survival. Meanwhile, a secret society seeks Ashoka’s demise; foul murders cloak a deadlier purpose; and behind it all looms Suwraith. But it is the Baels, the leaders of Her Chimeras, who may hide the greatest deception of all. The series is complete and is over 1600 pages of magic, mystery, romance, murder, and mayhem. Or at least that was my intention. 3) How do you go about the process of world building? I knew I wanted the world to have castes, and I wanted it to be somewhat like the Indian caste system, but I wanted something even more firm. I wanted the different castes to have significantly different physical appearances i.e. some look Indian, others Oriental, etc. I also wanted no chance for interbreeding amongst the castes. That was the basis for many of the choices I made for the world. In terms of building the city of Ashoka-and yes, the name was chosen in honor the ancient Indian emperor-I wanted a beautiful city. For appearance, I looked at all sorts of ancient cities on the Mediterranean and Black Seas. I looked at fantasy cities. I wanted something gorgeous. And I wanted a culture that, despite the caste system, wasn’t grim dark. I wanted the people of Ashoka to be backward in aspects of their thinking, but I also wanted them to strive for something better. 4) How’s a typical writing day like for you? After work, I come home and spend time with the family. Then at around 9 PM, I lock myself in my office and try to write some words that make sense. Some days are better than others. 5) Can you remember the first piece of fiction you wrote? It was a long time ago in a galaxy…oh wait. That’s a different story. But it was a long time ago. It was when I was sixteen, and it was for by creative writing class in high school. It was not good. It really was awful. And the first book I wrote. Shudder. Be glad no copy of that exists. 6) How do you prepare your books for publication after completing the first draft? The first draft is the most important draft. This is when you have your story down. As a much better writer than I has often said: you can’t edit a blank page. I write the first draft and then don’t look at the work for a minimum of two weeks. Then I print it out and start editing with a red pen. That process can be brutal. All those words I thought created a lovely story are often savaged. Sometimes the pages end looking more red than black. I enter those changes into the draft on my computer, print it out again, and keep going until I have a draft that I like. Then it’s off to the beta readers, and one or two final passes. Generally, I do six drafts. That’s not a predetermined number. That’s just what seems to be the case for me. The rest of the preparation, like cover art and typesetting I farm out to those who are much more capable than I at those kind of things. 7) Why did you choose self publishing over traditional publishing? Laziness. Seriously. When you look into all the things that go into query letters and synopses and what every agent and publisher wants, I just threw up my hands and said, ‘No thanks’. Except my language was more colorful. Later on, I did submit to all the major publishers and agents and was turned down by every one of them. I might have gotten a contract if I’d sent those queries out before I self-published. It turns out that publishers generally don’t republish something already published unless it’s selling like The Martian. However, for my third book, Audible Studios did purchase the rights to the audiobook format, so in some ways, I’m not completely self-published any more. 8) What has been your best marketing tactic? Telling people about the book and not being embarrassed to be enthusiastic about it. That’s key. I think writers in general are introverts, and we’re not likely to want to ‘brag’ about what we write. That was and is something very hard for me to overcome. So I told people about it on various science-fiction/fantasy forums, and tried to be positive about what I was writing without being over the top. Except in my review of my first book on Goodreads. That was all written very much tongue-in-cheek. I also had Kirkus review my first book, and thankfully, they liked it, so I was able to use their blurb all over the place. It also helps to have great cover art. People like a book based on the text, but they peruse a book when a bright cover catches their eye. And they purchase a book when the blurb catches their interest. All of those items: cover art and blurb have to be great to convince someone to take a chance on what you wrote. I wish it wasn’t the case, but it’s the world we live in. 9) Do you think self publishing has become tougher over the years? I’d say it’s become more competitive. Some of what’s out there by authors like Jacob Cooper, Jonathan Renshaw, Phil Tucker, and Lindsay Buroker are as good as anything being put out by large publishing houses. It takes something special and good these days. Mark Lawrence’s self-publishing blog-off is proof of that. 10) Which are your favourite books? Oh boy. Too many to list. Just off the top of my head, I’d have to say Lord of the Rings has to head any list. I also love the world of Thomas Covenant. Dune, Starships Troopers (or just about anything by Robert Heinlein). All the Pern books. The Riddlemaster of Hed. And so many more classics that I can’t include. 11) I believe you are a doctor too? How has it influenced your writing? I have a lot of fun coming up with creative deaths for some characters. I also am able to give some characters true diseases and know the symptoms they would manifest. And knowing toxicology is always fun. 12) What are you releasing next? Well I just released A Warrior’s Penance, the finale to The Castes and the OutCastes. Now, I’m working on a new series, that I hope to tie into the world of The Castes and the OutCastes. It’s an urban fantasy set in the 1980s with elements of the TV show Chuck that becomes a portal fantasy and eventually an epic fantasy. I’m deep into book 1 of a planned 5 novel series. This was a lot of fun! Thank you so much for interviewing me!